With a lot more open space for restaurant equipment and metal fabrication, we feel that this is the best use of space for our customers. So come on by or give us a call on any of the items here. We'll help you the best we can. 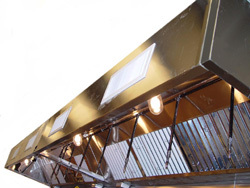 With our own Metal Fabrication Shop, we can custom build any size Exhaust Hood System to fit inside your restaurant. Whether you need to extend your existing hood system to accommodate new equipment, need a new one built, or simply have any questions regarding any type of metal fabrication simply e-mail or call us and we will be more than happy to answer any questions that you may have. © 2007 - 2014 Great Sun Corp.